Our goal at Keith Eck Financial is to help you with the single, most critically important financial event of your life- the successful transition of your business. Although you may find it hard to imagine life without your business, you probably do realize that you will transition out of your business at some point in the future- whether through retirement, death, or disability. Exit Planning is the creation and execution of a strategy allowing owners to exit their businesses on their terms and conditions. It is an established process that creates a written roadmap or exit plan, involving efforts of several professions facilitated and led by an exit planning advisor who ensures not only the plan creation, but its timely execution. Writing down each aspect of the transition sequence. At Keith Eck Financial we strongly believe that developing and implementing a well-designed exit plan is essential to the survival of a family business from one generation to the next. According to the Family Business Institute, “only about 30% of family businesses survive into the second generation, 12% are still viable into the third generation, and only about 3% of all family businesses operate into the fourth generation or beyond”. Our team works with you, your family, attorneys, family business consultants, and business valuation experts to help you transition your company on your terms and on your schedule. Click here to listen to Keith’s radio interview on The Exit Coach Radio Show! The Exit Coach Radio Show is hosted by Bill Black and covers a variety of topics such as growing a small business, when is the right time to exit, and exit strategies for business owners age 50+. Bill Black has conducted over 275 radio interviews with top advisors to help business owners grow and protect their businesses. On August 15th, 2014 Keith spoke to Bill about the special planning needs of farming business owners. Please listen to the interview and share it with your friends and any business owners you know! During the years of 2008-2012 Keith Eck Financial was one of the sponsors of the Entrepreneurial Management Center (EMC)’s Family Business Forum at San Diego State University. This sponsorship integrated fully with our passion for assisting owners to ensure the continuity of their businesses. The EMC Closely-Held and Family Business Forum at San Diego State University was dedicated to the growth and development of closely-held and family business members by providing entrepreneurial education, training programs, resources and peer support. The forum addressed issues such as leadership succession; estate planning; governance; strategic planning; trans-generational entrepreneurship; traditions and values; power, control and compensation; and roles and responsibilities of family and nonfamily members. Keith is a member of the Business Enterprise Institute (BEI)'s International Network of Exit Planning Advisors. BEI was founded by John Brown, an attorney and the author of the best-selling book on on Business Exit Planning, How to Run Your Business So You Can Leave It In Style. John developed The Seven Step Exit Planning Process™ to help business owners exit their companies in style and benefit from their life’s work. 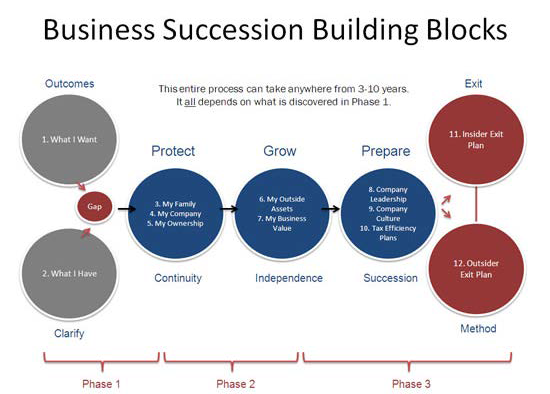 Keith has been working for over 30 years to manage the succession planning process for his clients by providing them with all the tools and strategies necessary to assist them with preserving their family business legacies. At Keith Eck Financial we follow a strategic 7 Step Process that has helped thousands of owners to exit their businesses in style. As part of this Process, you also must consider what would happen to the business and to your family in the event your death or disability precedes your planned exit. As a BEI Network member, we can assist you with single, most critically important financial event of your life- the successful transition of your business. The individuals or entities to whom the owner wants to sell or transfer the business. The starting point for reaching your exit objectives begins here: How much is your business is worth today? How much cash flow does it currently generate? How much income do your non-business assets produce? We then project future cash flow as well as the future value of your business and non business assets. Most importantly, the combination of Steps One and Two tells us the extent of value or cash flow increase that is necessary to meet your goals. Based on the first two steps, we make specific recommendations to help grow business value, protect existing value from the actions of others, and preserve company value by minimizing income taxes. Based on your company’s needs, these recommendations may include installing or updating financial reporting systems, aligning employee performance with the attainment of your profitability goals or protecting proprietary information through covenants not to compete with key employees. If you choose to sell your company to a third party, we design strategies to improve the likelihood of a successful sale, minimize the taxes you will pay upon sale, and maximize your sale price and terms. If you choose instead to retain ownership or transfer the company to insiders, you will skip this Step. Insiders are children, co-owners or key employees who often do not have the financial resources to pay owners what their companies are worth. If you choose to transfer your company to insiders, in Step Five we create a detailed plan to ensure that you receive the money you desire from your business, minimize the risk of non-payment and ensure that you retain control of the business until you have been fully paid. As part of your Exit Plan, we coordinate your business continuity planning with your lifetime objectives. The purpose is to ensure that your goals (such as transferring the company to the successor of your choice and having your family receive full value for your ownership) are met whether you survive to see your business exit or not! In Step Seven, we coordinate your estate plan with your Step One objectives. Our design emphasizes tax efficiency (in the transfer of wealth or of the business to family members or charity) and ensures that your family receives the amount of annual income necessary to satisfy the financial security goal you set in Step One. Call us today at toll-free 877-731-3115 so that we can help you get started with the succession planning process.